Fresh, unseen reportage from black & white and full colour imagery available for purchase. And lots more to come! This website is my personal tribute to my remarkable father, Terry Spencer. To his work and life, both of which he undertook with enormous energy, commitment and humour. Before he died, he asked me if I would like to take over the running of his photo archive and try to market it further. Naturally, I jumped at the opportunity and the more I have delved into this archive, the more fun I have had with it, the more interesting people I have met as a result – and the more I admire the old man. I was privileged to have met some of the famous people Dad photographed, when he took me along with him on some stories. The most exciting, of course, were the Beatles (at Twickenham film studios), followed by the dishy French ski champion, Jean Claude Killy (at his family’s hotel in Val d’Isere in France). I also enjoyed meeting Hayley Mills, when I was left to babysit her adorable son, Crispin, in their home in London while Dad photographed her. I did NOT enjoy meeting the rude and inhospitable Rex Harrison. Fame does not always equal charm and warmth. Fortunately, he and my mother had already written their joint autobiography (Living Dangerously) so my sister and I have much of their extraordinary lives written down. I know my sister, Raina, is behind me all the way with this tribute to our father, but is busy with her own life as a wife and mother in Australia, leaving me to get on with it. I have left the selling of these images to the experts. To Camera Press in London for the selling of the digital images. For prints of Dad’s rock material please contact me. Dad was still signing beautifully-printed photographs of stars like Bob Dylan, Robert Plant, Freddie Mercury, Boy George, the Beatles etc, in his bed in the hospice, where he was dying of cancer. Truly, a workaholic to the very end. 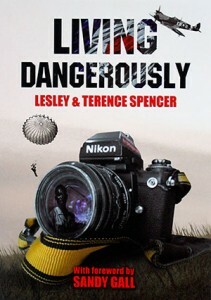 For the time being, I am managing the sale of the book, ‘Living Dangerously’ myself, but only within the U.K.
For more information about the Archive please contact Cara Spencer. Licenced images available from the Camera Press website. ‘Living Dangerously’ Exhibition 19th December 2017 -17th January 2018 at the Nairobi National Museum, Kenya. Opened by Mr Tony Reilly O.B.E., Country Director, British Council.